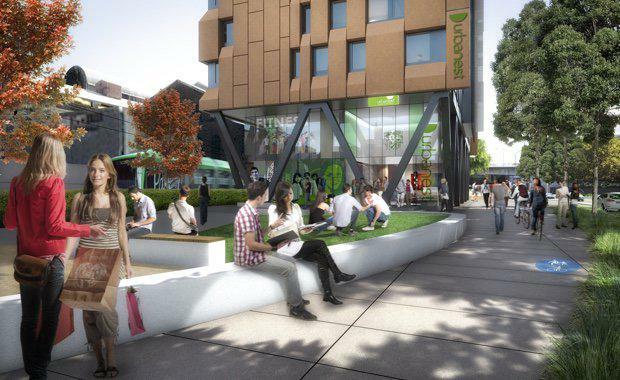 The New South Wales Department of Planning and Environment has today approved an application for more student accommodation in Darling Square as part of the renewal of Darling Harbour. The new building will provide a fully catered student accommodation facility for up to 668 students in 520 rooms. Plans include a 22-storey Urbanest building with large communal spaces, a central courtyard and bicycle parking. The location is highly accessible for students, close to universities, public transport and services. A Department spokesperson said the application was publicly exhibited between November and December 2015. “There were seven submissions received from Government agencies. No public submissions were received,” a spokesperson said. “The key issues raised during consultation were the size of student rooms, design quality, bicycle parking, security, use of the central courtyard and rooftop area. “Consultation with the community and stakeholders is enshrined into the process for assessing projects like these and the Department has addressed the issues raised in its assessment. “The Department finds the proposed new accommodation building is of a high design standard with acceptable room sizes, privacy, and facilities including bicycle parking for future students. The 20-storey building has also had an application approved to add a communal rooftop terrace, a movie screen and a pedestrian bridge linking the two accommodation buildings. The Department has approved the modification request with the condition the new communal rooftop area is accessible to all students. “The proposals were thoroughly assessed against clear rules and policies, which are the same for every applicant.